Yesterday’s press conference at HP Center was an exercise in time travel by way of testimony and the kind of storytelling that can only come from family by birth, choice, and circumstance. For NHL veteran Owen Nolan, it was a time to make the announcement that many players dread. Supported by his friends, colleagues (as though there is a difference between the two), parents, wife and children, he stood before the crowd, his voice choked with emotion as the well-loved power forward announced that he was retiring from the NHL. 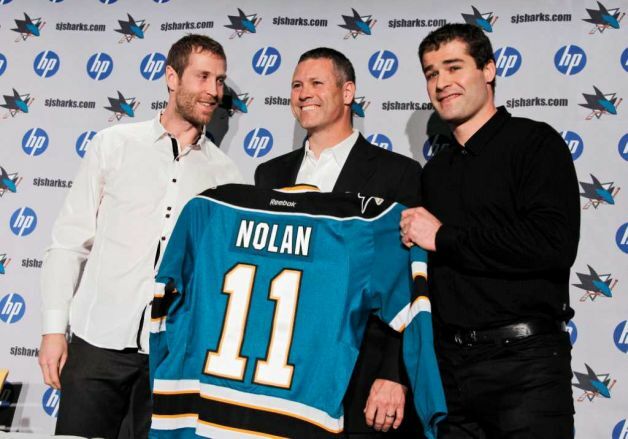 For Sharks GM Doug Wilson, it was a chance to restore the organisation’s magic number by declaring Nolan had come home. “To have him retire as a Shark means a lot to us. To accomplish what he has accomplished in this game is something special: five time All-Star, 1200 games as one of the purest power forwards in the league…There were hundreds of guys who didn’t enjoy playing against this guy. That’s a compliment. He played with so much heart. “I want to thank the the entire Nolan Family. It has meant a lot to have him on our side. He won’t be the last Nolan to skate in the building. His son has already committed to join us next year. We are tremendously proud you’re a part of the Sharks family. Nolan reflected on his decision to hang up his skates, at least for a little while. His family looked on, visibly moved as Nolan cleared his throat and continued with his heartfelt valedictory statement. In spite of the emotional beginning, the event was hardly a somber affair. Nolan was all smiles as former teammate Bryan Marchment participated via telephone about the kind of teammate Nolan was. His description of Nolan as a brother in arms possessed of a fierce competitive spirit on and off the ice added to the very personal portrait that was painted by friends, coaches and former teammates yesterday afternoon. Among the many, many facts and figures that were cited about Nolan’s impressive career was one that caused everyone, even Nolan himself, to pause and consider the implications for a moment. Nicholson ended his comments with the reminder he was last active player in the NHL to have worn a Nordiques sweater. Also notable was the presence of so many past and present captains. Two were in attendance to represent the Calgary Flames, and including Nolan, there were four Sharks captains on hand (Sharks GM Doug Wilson, who was the team’s first captain, Patrick Marleau and current SJS leader Joe Thorton.) Marleau and Thornton presented a Sharks sweater to Nolan.